After seven months, Teads is still on top! comScore’s latest Video Ad Ecosystem Ranker for July 2016, shows Teads is surpassing the industry’s largest players in unique viewers. Standing strong above Adap.TV, Spot X, BrightRoll, Videology and LiveRail, Teads continues to dominate the video advertising industry. 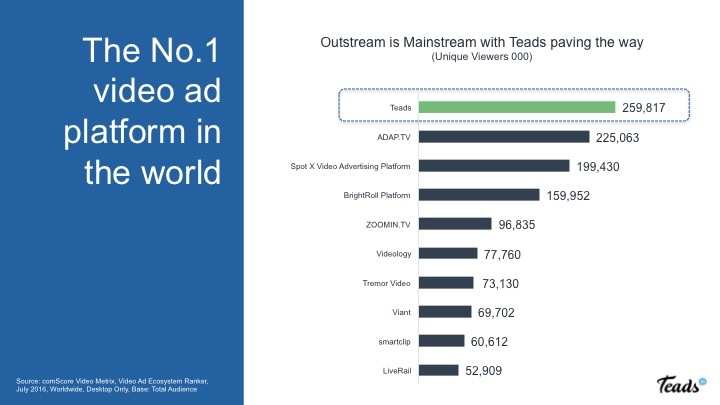 As of July, Teads reaches over 259 million unique viewers worldwide (desktop only). According to Teads’ servers, the company’s mobile reach is even bigger at 1.2 billion unique users, including 720 million on smartphones. Even more exciting is that these numbers are only expected to grow. Recent research from Teads shows 66% of brands believe outstream video will grow over the next two years. And the opportunity on mobile is killer, with 60% of brands increasing their digital investment agreeing outstream is better optimized for mobile than instream video ads, i.e. pre-roll. Outstream is now mainstream and Teads is leading the way!